This is a listing of articles under the purview of the Engineering, Health Sciences and Military Workgroups that have been designated as particularly relevant to the Emergency management Subgroup. 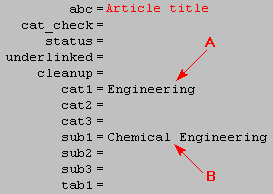 List Emergency management as one of the subgroup categories (i.e., sub1, sub2 or sub3) as indicated by the B in the adjacent image. Pages in category "Emergency management Subgroup"
This page was last modified 19:33, 19 May 2010.